Sanaa (AFP) - A Saudi-led coalition air strike on a sewing workshop killed at least two people and wounded 15 in the rebel-held Yemeni capital on Sunday, the owner told AFP. "Two employees, including a 14-year-old boy, were killed and 15 others wounded in the overnight air raid," Faisal al-Musaabi said. A search was underway for another employee still buried under the rubble of the building in the east of Sanaa, he added. 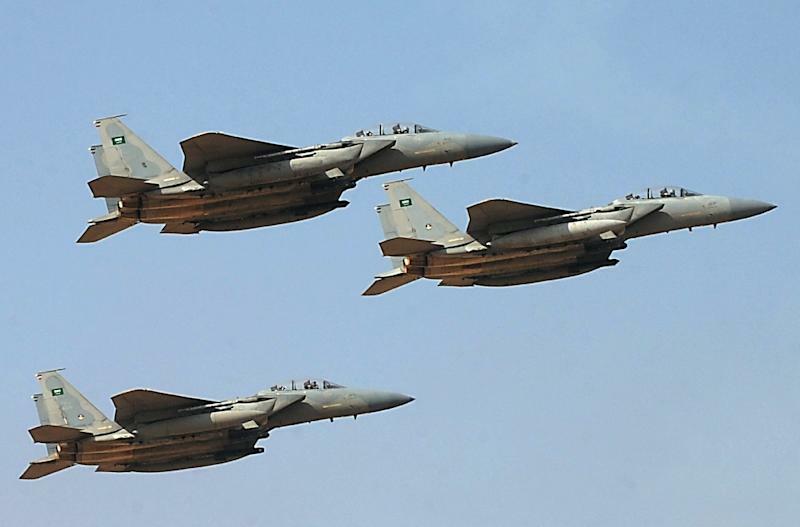 The coalition has been carrying out air strikes against Iran-backed rebels across Yemen since March. The rebels, who have controlled Sanaa since September 2014, reported a higher death toll of 11 employees killed and four others wounded in the strike on the workshop, according to their sabanews.net website. The United Nations says more than 6,100 people have been killed in Yemen's conflict since the coalition began its raids, about half of them civilians. On Sunday, Human Rights Watch accused the Saudi-led coalition of using US-supplied cluster bombs in Yemen, causing civilian casualties. "Saudi Arabia and its coalition partners, as well as their US supplier, are blatantly disregarding the global standard that says cluster munitions should never be used under any circumstances," said HRW's arms director Steve Goose. One type of air-dropped cluster munition used by the Saudi-led coalition in Yemen, the US-manufactured CBU-105 Sensor Fuzed Weapon, has "harmed civilians in at least two attacks," Goose said. "The evidence raises serious questions about compliance with US cluster munition policy and export rules," he added. "The Saudi-led coalition should investigate evidence that civilians are being harmed in these attacks and immediately stop using them," said Goose. The coalition last month announced that an independent inquiry would examine charges of possible abuses against civilians in the conflict. A panel of UN experts says the coalition has carried out 119 sorties that violated humanitarian law, and called for an international probe. Meanwhile, the United Arab Emirates -- a key member of the coalition -- announced that one of its soldiers taking part in the Yemen war was killed on Sunday and another was wounded. The Armed Forces statement published on the official WAM news agency website did not give details. But a Yemeni military source told AFP that a bomb-laden vehicle targeted an Emirati armoured vehicle in Yemen's southern Lahj province, killing one soldier and wounding another. A Yemeni civilian also died, the source said, adding that the attack appeared to be carried out by the Islamic State jihadist group, which is becoming increasingly active in the south. The UAE has lost more than 70 soldiers in Yemen since the Arab coalition launched its military campaign in support of President Abedrabbo Mansour Hadi's internationally-recognised government.